I'm going to keep today's post short and sweet. 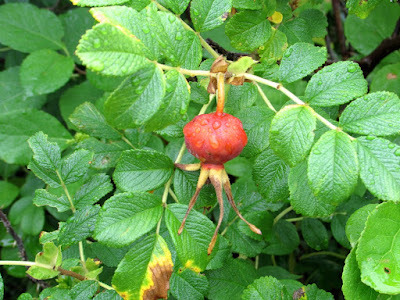 This morning the skies opened and dumped sheets and sheets of rain. Wonderful! It's been so dry. I did have to deal with a minor inconvenience. The power was out for a while. It came back on but has been flickering. I've braced myself for the possibility of another outage and am taking care of the most crucial things that require power. I'm just glad I don't have to contend with flooding. I have plenty to keep me occupied on this rainy day. A new yarn base arrived, and it's time to get busy. Monday, thank goodness you arrived as scheduled. This weekend I was caught in a crazy loop of mishaps, so today I'm grateful to be out of the tangle. 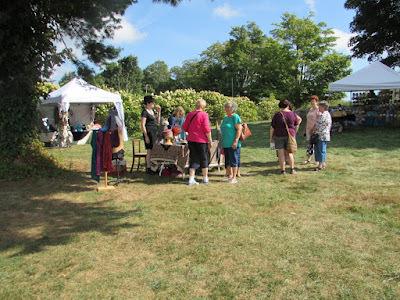 On Friday I traveled to the Southern Adirondack Fiber Festival. When I left, everything was on track. Somewhere between here and there the traffic turned ridiculously horrible. I deal with a lot of traffic on a regular basis and usually have a pretty good assessment, but even this was more than I had anticipated. 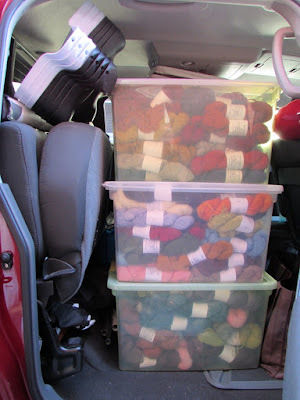 I would have been happy to be a passenger quietly knitting away, but, alas, I was the driver. Due to the traffic on Friday, I missed the time slot for booth setup. That left no option but to do it all Saturday morning before the show. Saturday morning dawned and setup was going smoothly until I realized I didn't have extension cords for the lights. I must have left them behind. No problem. I took a deep breath and made a quick run to the hardware store for a random assortment of cords. At this point in the morning I still wasn't sufficiently caffeinated and my quick cord calculations were a bit off, but we made do and shuffled the booth around. The rest of the weekend progressed slightly out of sorts. Maybe it was the different booth configuration. After the show on Sunday we hit the road only to discover the traffic was equally unbearable with numerous cars pulled over on the shoulder. I'm blaming it all on the supermoon. I did find a silver lining in a weekend that was oddly out of sync. 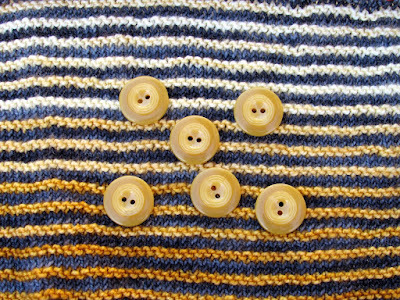 The perfect buttons for a project that's almost off the needles. Usually I'm scrambling for buttons at the last minute. This time they're ready and waiting. 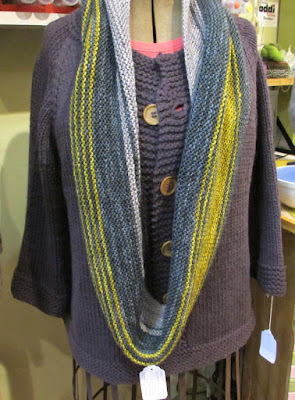 I've been expanding the Lucia color lineup for the fall show season. Some of the colors are planned and tested, others are the potluck variety. 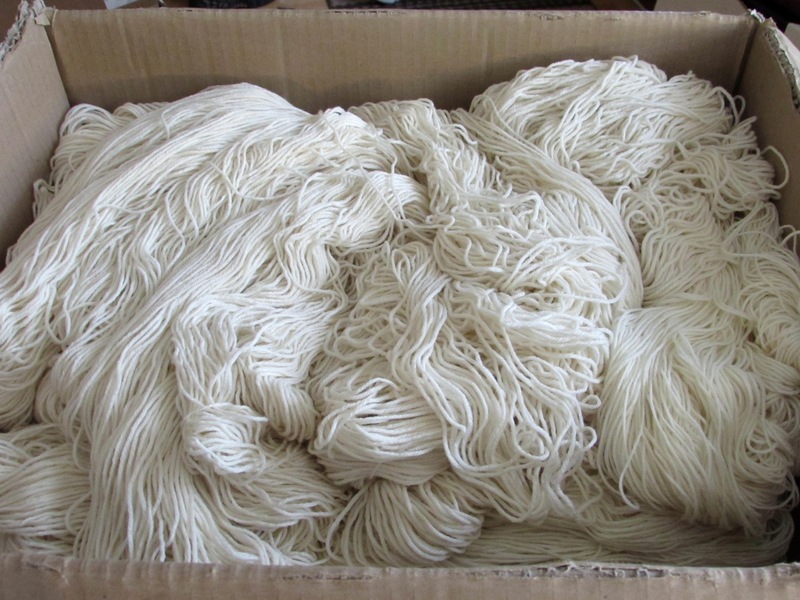 In some ways dyeing is like knitting. 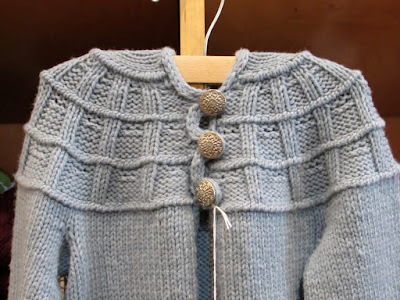 Some knitters work a garment through to completion even when they realize along the way that it's not going to fit the way they had intended. The theory is that it will fit someone - just not the intended recipient. I have that same theory for dyeing colors. Just because the color isn't exactly what I had envisioned doesn't mean that someone else won't love it. That theory gives me the green light to go ahead and dye with reckless abandon. After all, no matter what comes out of the pot, someone somewhere is bound to like it. Here is one of this week's potluck colors, and it exceeded my expectations. Lucia, colorway Fall (after the dust settles I'll post it to the website). I have a soft spot for anything in the yellow family, so I had to show great restraint and not cast on with this right now. It's on my list for a future project. The other day I looked over my fall schedule and resigned myself to the fact that I'm going to be living out of my truck for the next few weeks. 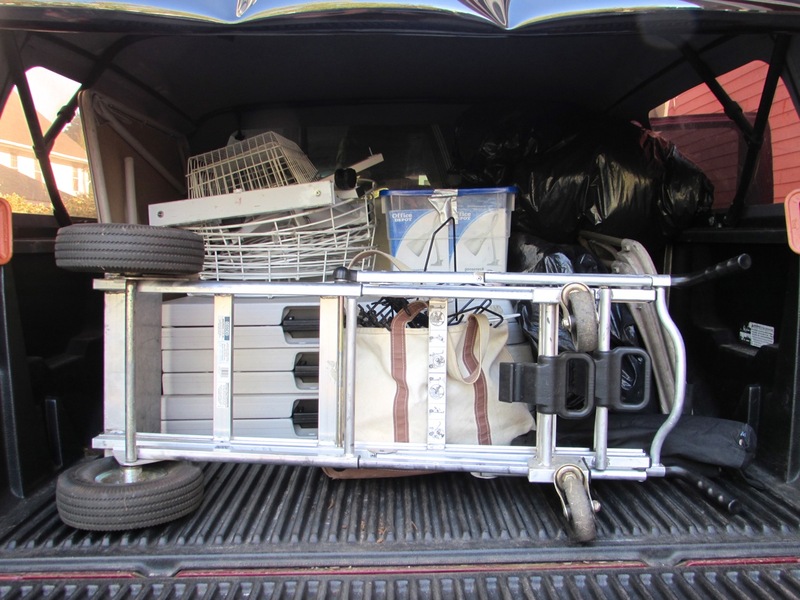 With several-back to-back weekends on the road, it doesn't even pay to unload in between shows. I decided to make the best of the situation. I'm off to a good start and packed everything neat and tidy. Of course the real challenge is to keep it that way. By the time November rolls around, I'm sure the truck will be a chaotic jumble of fixtures and bins and baskets and empty coffee cups. But today when I head out for Southern Adirondack Fiber Festival, I'm going to savor this well-organized truck. 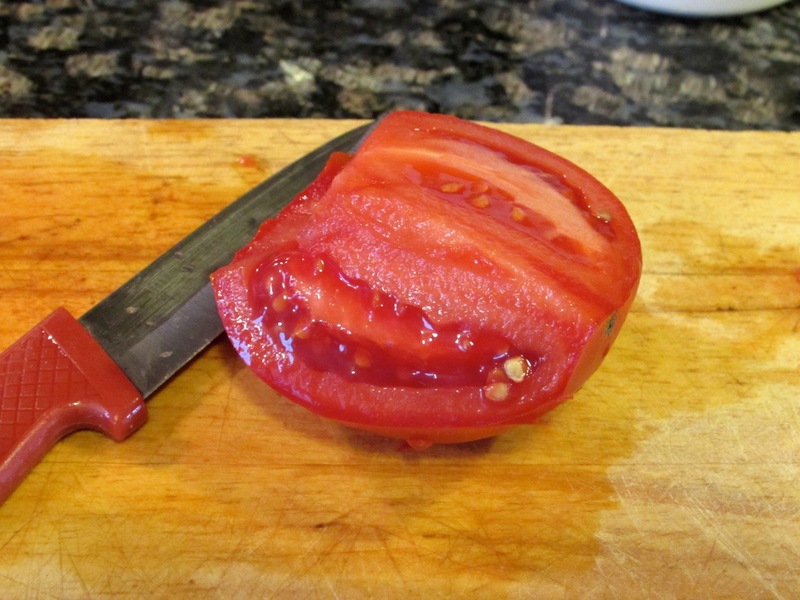 Tomato season is winding down, and we're enjoying it to the very end. We can't get tomatoes like this in winter. My color inspiration this week . . . Happy fall! I'm celebrating the fall fiber season with a few new samples, and here's a preview of one. Penrose Tile. Both of my live models are occupied these days, so I'm making do. 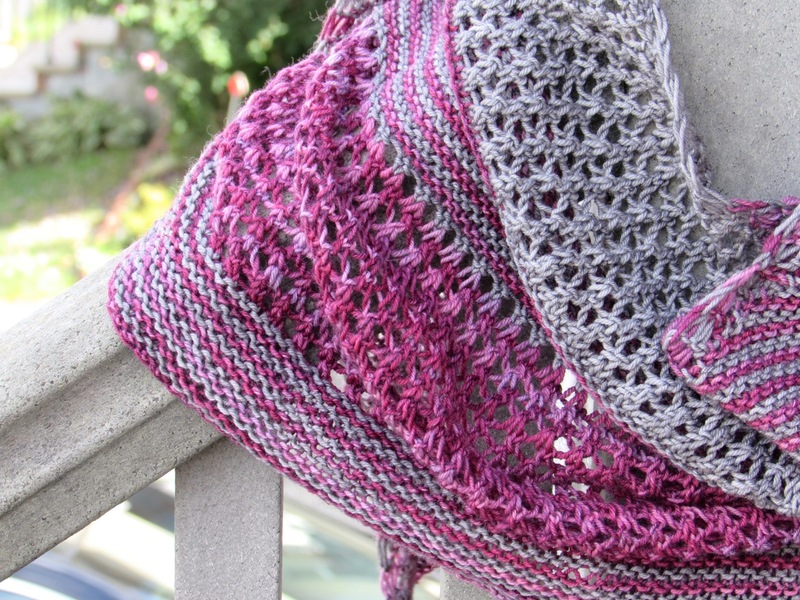 The yarn is Lucia, colorways Berry Patch and Thunder. I discovered just this morning that Thunder isn't listed on the website. For your reference it's a bit darker in real life. Many thanks to Robin for whipping this up. The flying needles award belongs to you. Some fiber events are outdoors, some are indoors. This past weekend I got to sample the best of both worlds. On Saturday I was at Tangerini's Spring Street Farm for a one day event. The setting at the farm was lovely. I had never been to Tangerini's before, so it was fun to discover a new place. And I got to meet some people face-to-face whom I had only known via email or online conversations. Talitha Kuomi was one. Her Munka hat made out of Marie was on display. This hat has been on my list, so it was nice to see it in person. 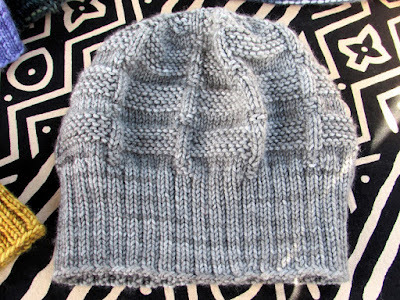 With hat season right around the corner, I'll definitely be making one of these. This sweet sweater, Baby Kylie, caught my eye. 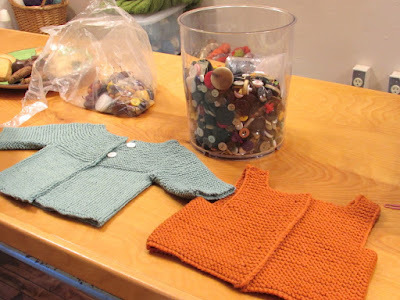 I'm tucking the idea away for the next time I need a baby sweater. Pam Sluter was also on hand with samples of her work. 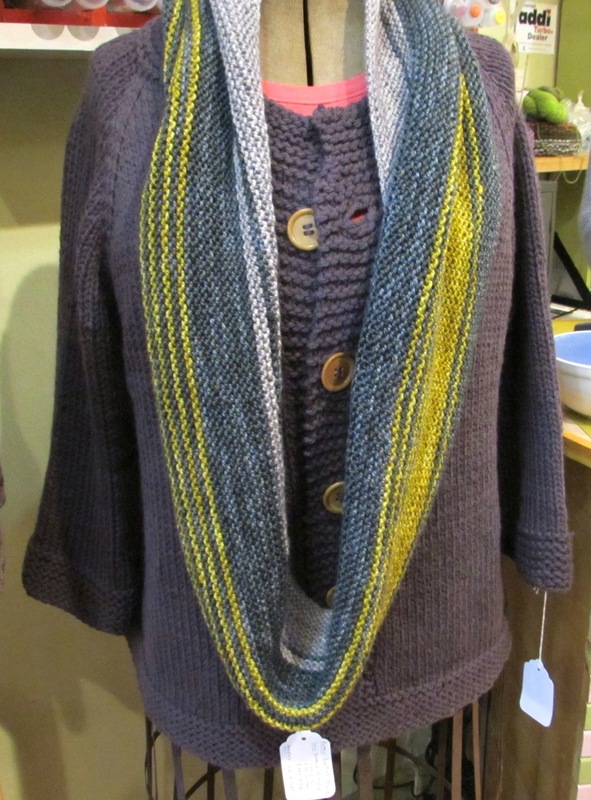 I have a thing for gray and yellow, so of course Grellow caught my eye. 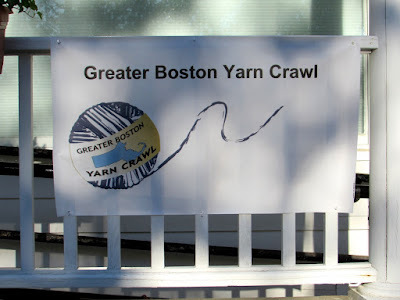 Sunday I was off to one of the stops on the Greater Boston Yarn Crawl. 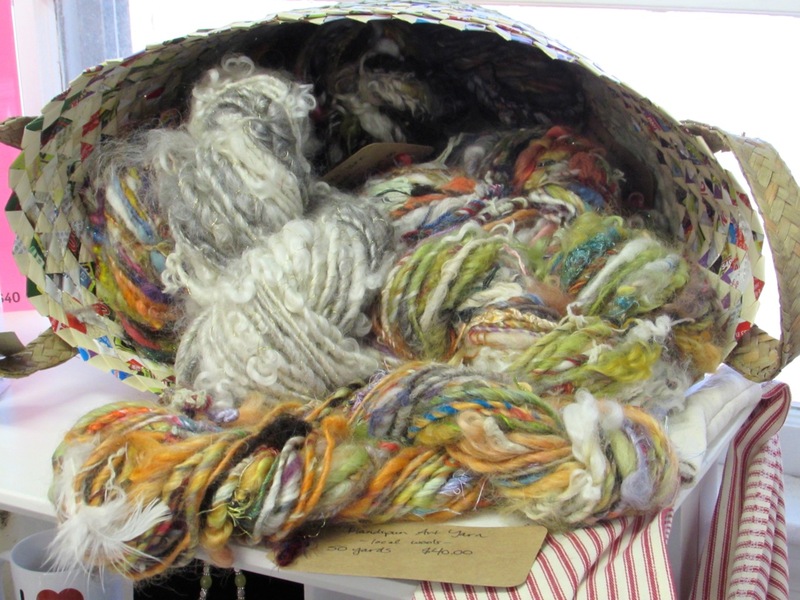 I spent the afternoon at The Fiber Loft. 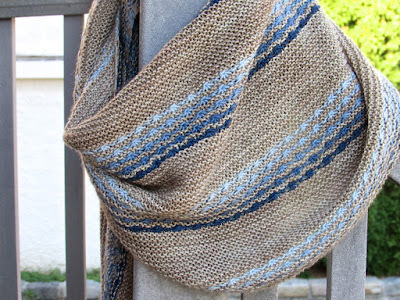 This is the shop sample of Moonraker made out of Lillian. This has been on my list too. Now that I've seen it, I've bumped it up a few notches. 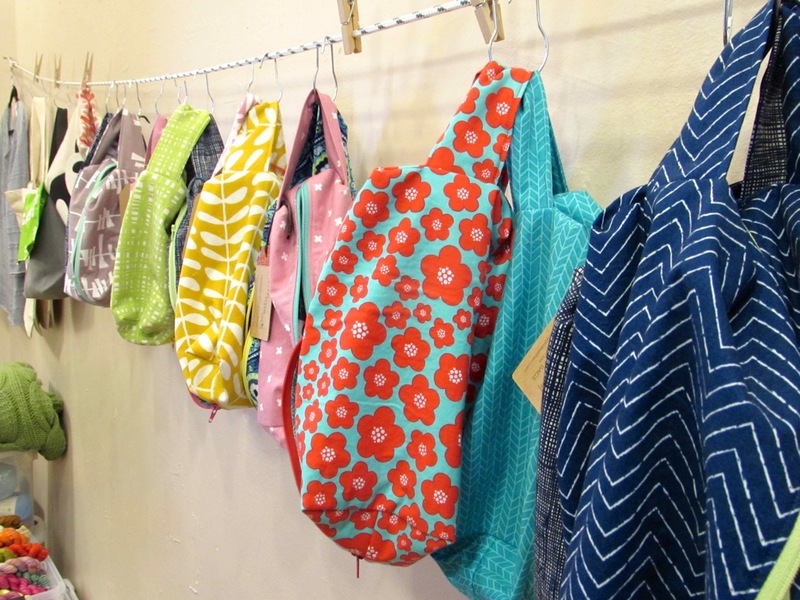 The Fiber Loft is a well-rounded shop. 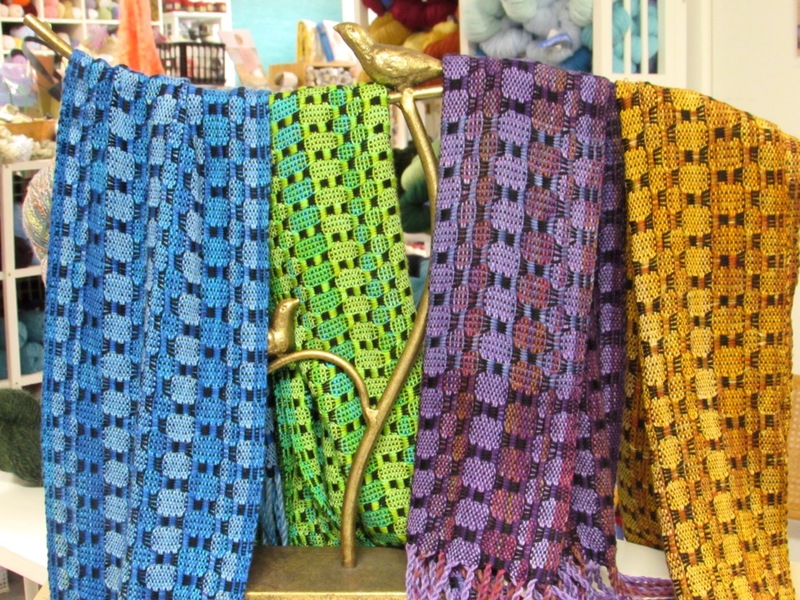 In addition to knitting classes, they also offer classes in crochet, weaving and spinning. I spy a pretzel. What do you see? Now I'm off to play Monday catch-up. I'm heading into the weekend with one less project in production. Purpleplexy is off the needles and blocked. This substantial shawl was taking up a lot of room in my knitting bag, so it feels good to lighten the load. Purpleplexy was a filler project for me. 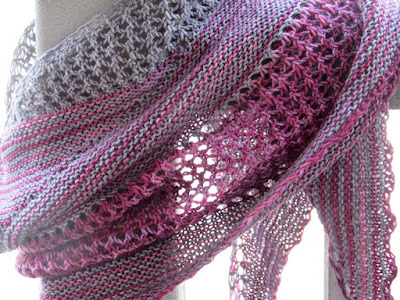 I would work on it in-between more pressing projects. Because of that, production dragged on longer than it normally would have. 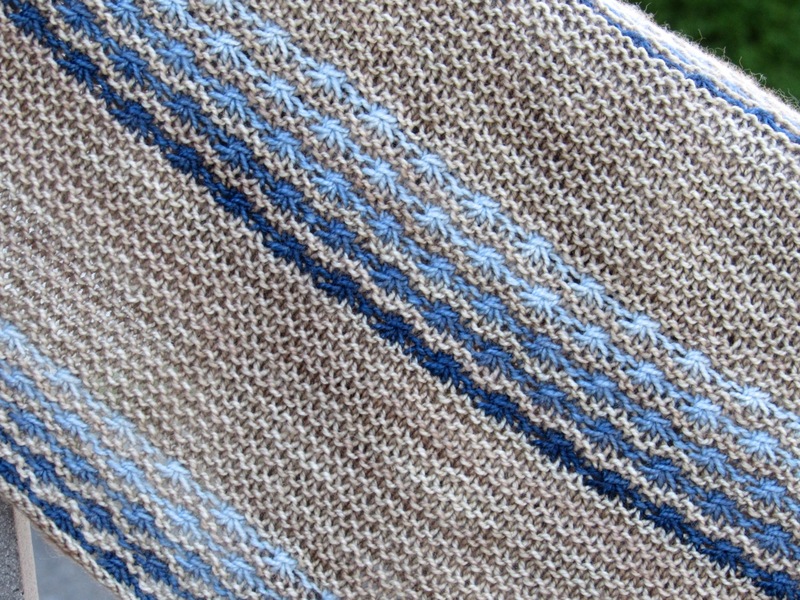 This design is mostly garter interspersed with daisy stitch gradient stripes. 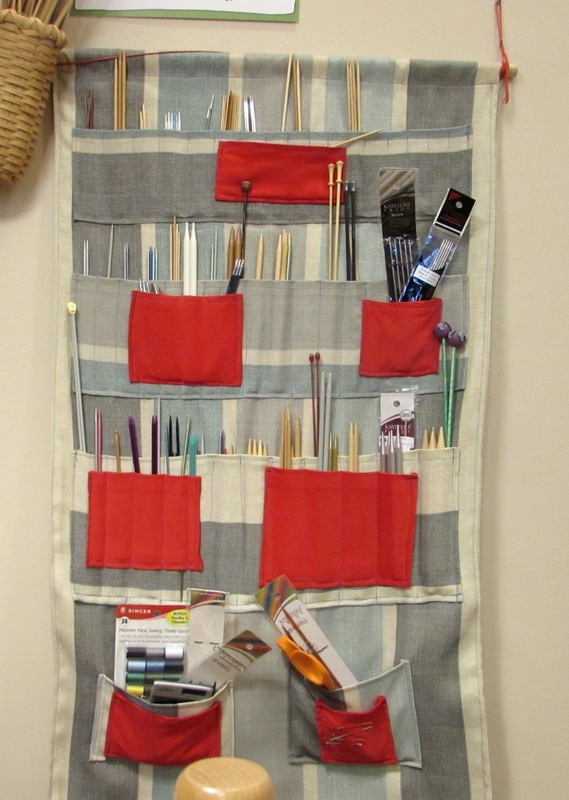 As with most projects that require color combinations, half the fun is picking the colors. The yarn is Lillian - Wheat and Drizzle Gradient Bundle. On the subject of gradient bundles . . . not a week goes by that I don't receive several requests for them. Here are a couple options for those who are interested. 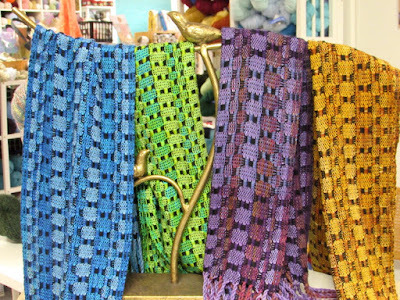 I will have a full selection of gradient bundles available at Rhinebeck - Building C, Booth 42. 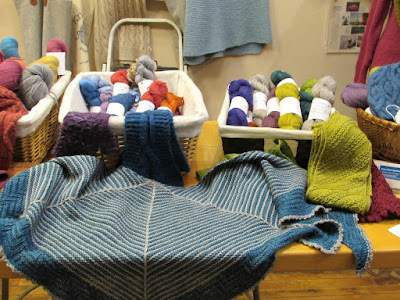 For those who can't make it to Rhinebeck, the bundles will be posted to the website later this fall. If you want to make sure you get in on the fun, I'm also offering a preorder option. Contact me for details. 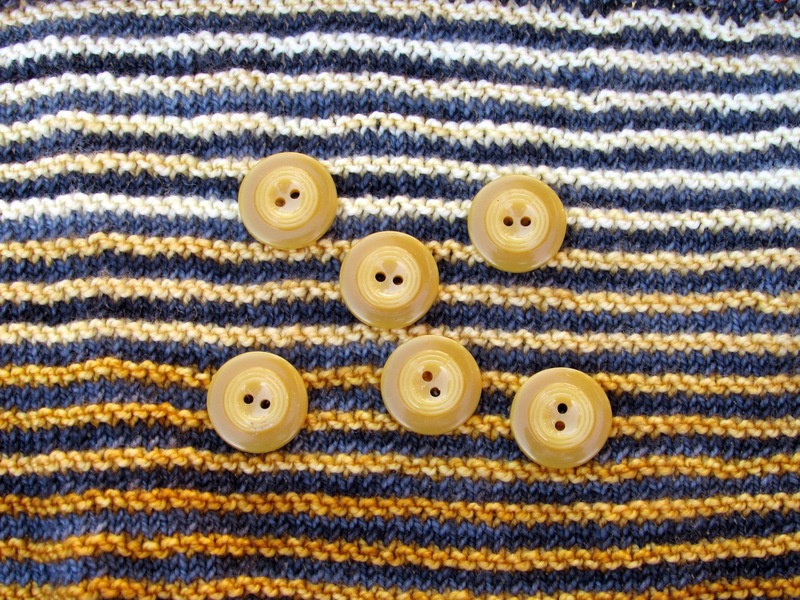 Every once in a while a pattern catches my eye and calls out for immediate attention. Usually I'm strong and file it away in my queue. My rule is if it sits in the queue for a while and I'm still really smitten, then I can start it. 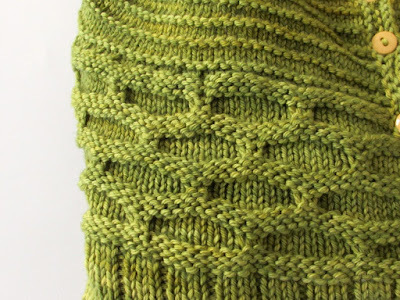 I can't tell you how many times I've looked at a pattern in my queue and commented, "What was I thinking?" I guess rules were meant to be broken because yesterday I fell hard for Kaerlig. 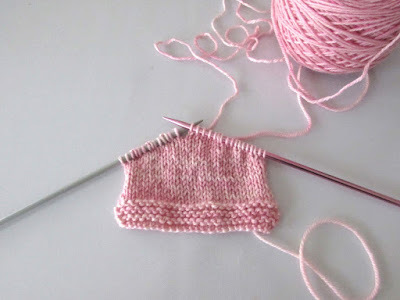 Someone commented that these mitts had an intriguing thumb gusset, so of course I had to investigate. After that it was all over. 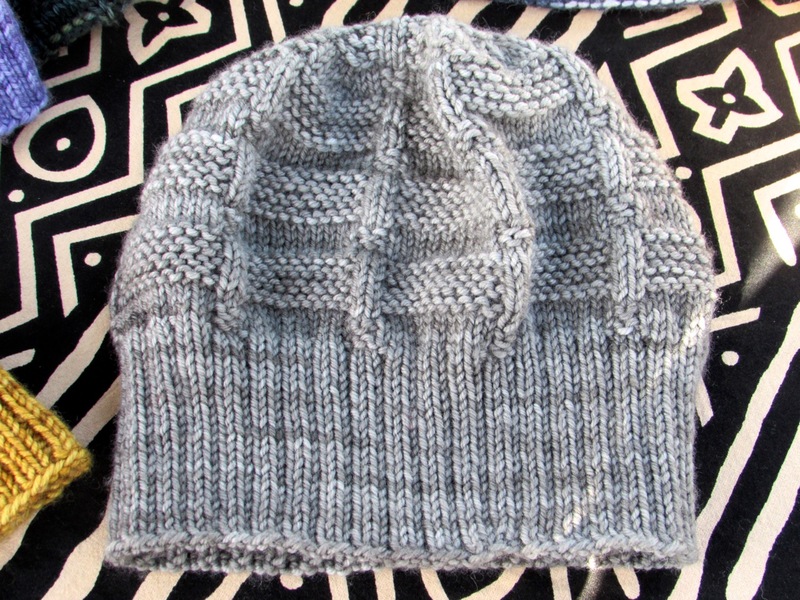 I went on a little knitting bender late last night. 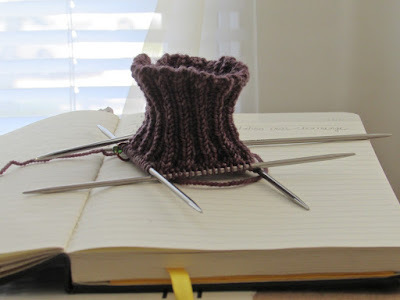 This morning I'm looking at the cuff and debating if I want to make it a little deeper. 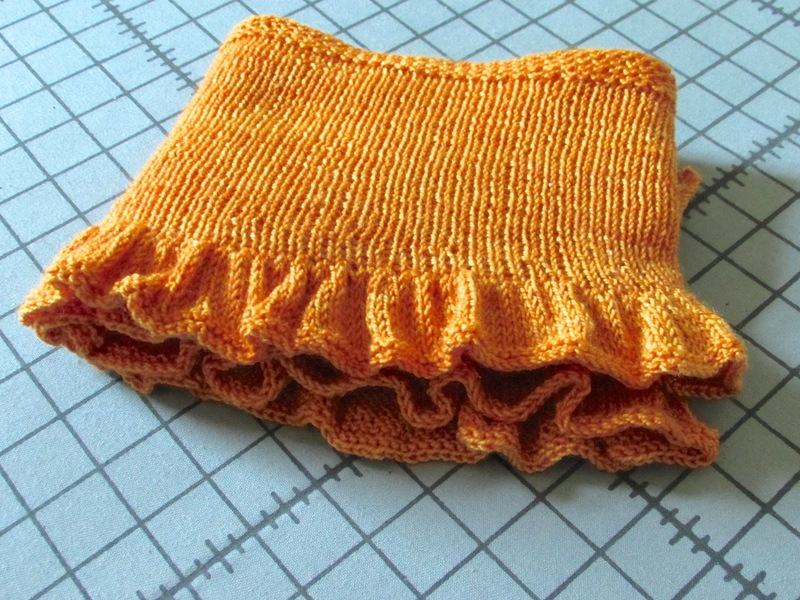 The cuff is pretty standard, but after that things get interesting. I can hardly wait. 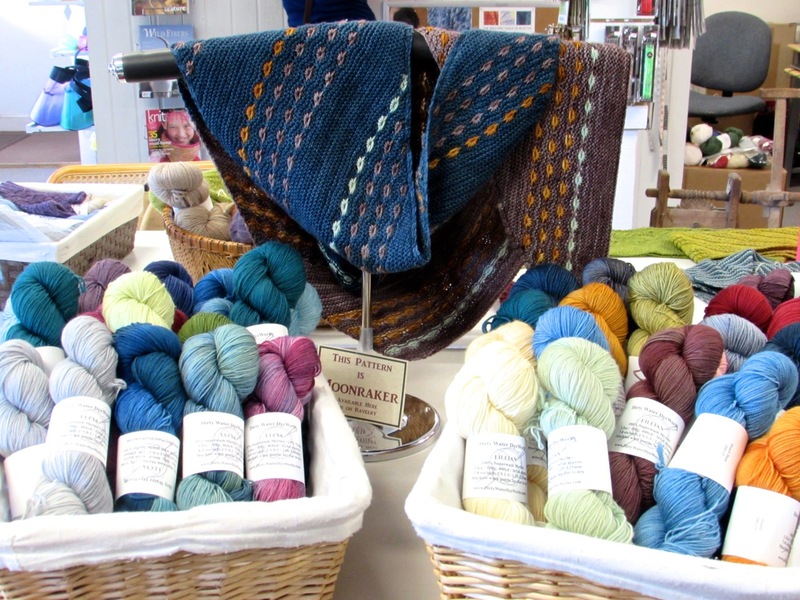 On Saturday I kicked off the fall fiber festival season with a trip to KnitWit in Portland. In the morning I led a workshop on different short row techniques. It was a good group and a fun session. In the afternoon we had a little yarn tasting. It was a busy afternoon at KnitWit. If you're ever in the area, I encourage you to make time for a stop at the shop. You won't be disappointed. Maybe something like this is the solution for my messy box of needles. I was delighted to see Elizabeth's Gulf of Maine. I had seen pictures online but seeing the sample in person makes all the difference. 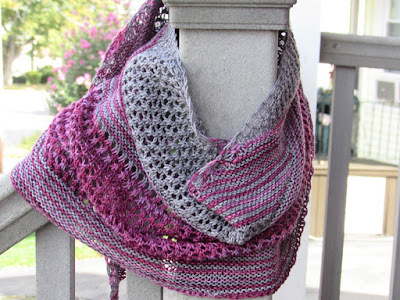 I'm a sucker for this color combination and have added the cowl to my queue. 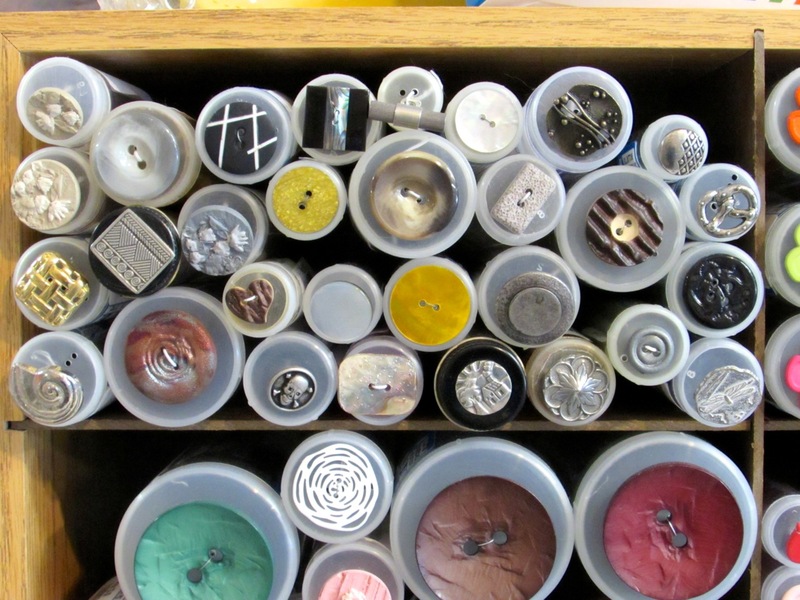 Buttons, buttons and more buttons. Thanks to everyone at KnitWit. It was a great day all around. I made a quick recovery, and this week has been productive in spite of the fact that it feels like I lost a day. A late season heat wave complete with humidity slowed down the process of drying yarn, and now I'm scrambling to get everything labeled. I'm itching to start a new project but am holding off until all the work is finished. Some days it's hard being the boss. Thanks to everyone who left a comment. I appreciate all the button suggestions. The winner of the August giveaway is twotone aka Amy. Be sure to check your Ravelry messages for all the details. Monday holidays usually throw me off balance, and this week is no exception. Yesterday I was convinced it was Monday, and the week stretched out leisurely in front of me. And then reality sunk in. Late in the day, it hit me that Monday had already come and gone. Today is the middle of the week, and I've had to adjust my time frame. First I'm tying up a couple loose ends. 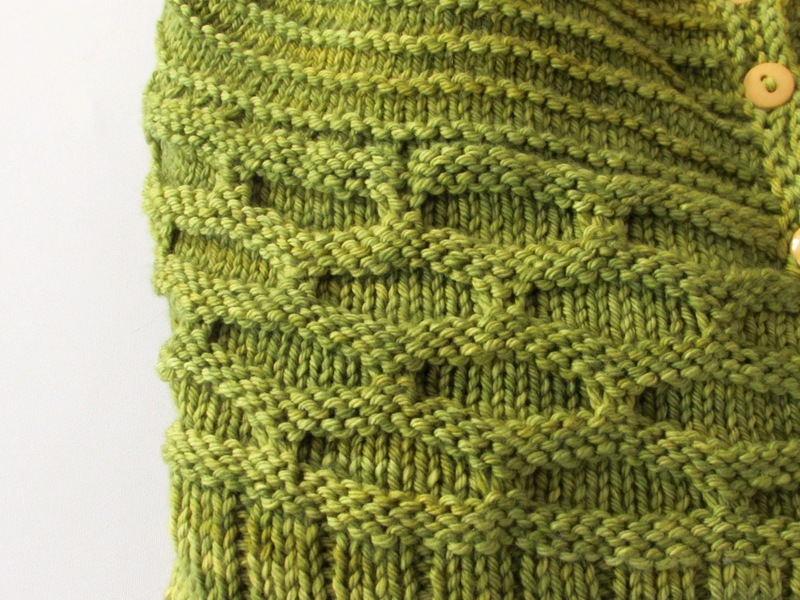 On Saturday I'll be at KnitWit in Portland. 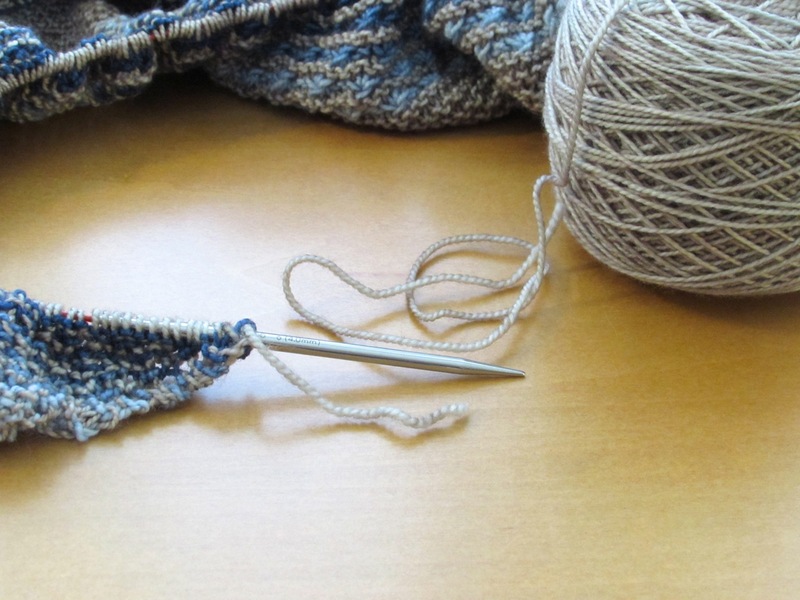 In the morning I'll be leading a workshop on short rows. In the afternoon we'll have a yarn tasting. At last count there were still a couple workshop spaces left. If you're interested, call the shop. My Washington Square is finished. I sewed on the buttons, wove in the ends and gave the sweater a good bath. 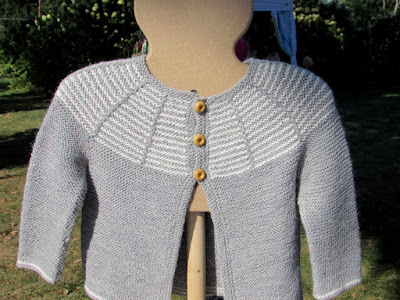 After I took the sweater off the needles, I tried it on. I wasn't so sure I liked it, but the bath and blocking worked miracles. It's a keeper. 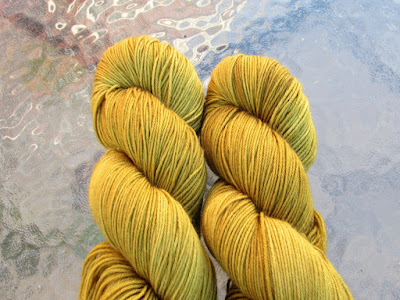 The yarn is a superwash worsted weight Merino that I dyed. I don't carry this yarn on a regular basis, but I've used it here and there for special projects. 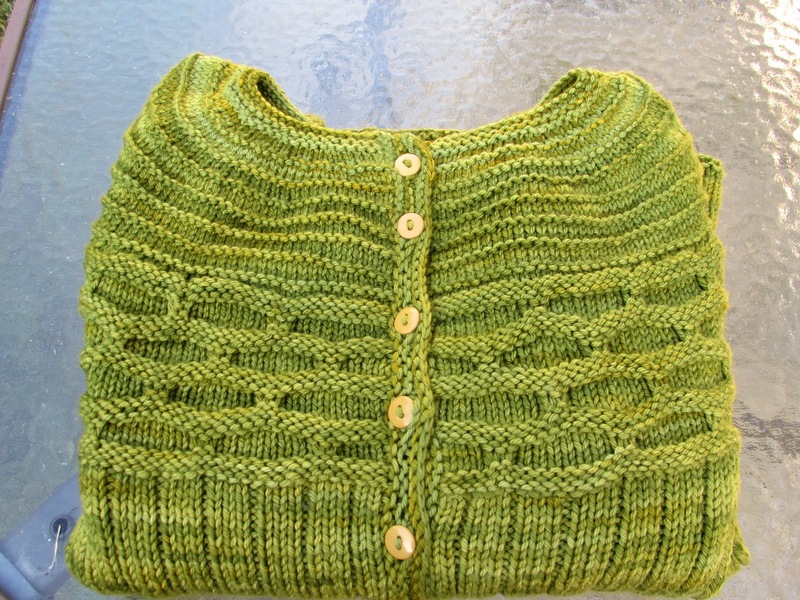 We're in the midst of a late summer hot spell, so I'm putting this sweater away. It will be ready and waiting for proper fall weather. For a week that's been all over the place, it's only fitting that today's blog post is the same. Yesterday I did a little gambling with my knitting, and for once I came out on top. 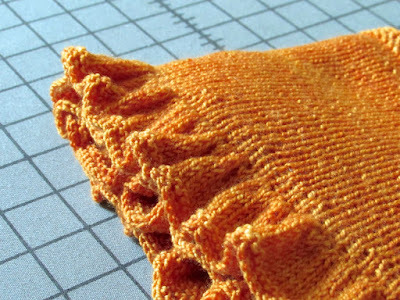 I made an educated guess that I had enough yarn to work one more row of almost 400 stitches. I won with less than 3 inches to spare. Other than that the only knitting excitement was a phone call with a friend for a live Ravelry pattern search. It's helpful to debate the pros and cons with someone, and comments like this will definitely steer you in one direction or another. "If you're knitting a Rhinebeck sweater, look at the yardage. That pattern takes too much. You'll never get it done in time." 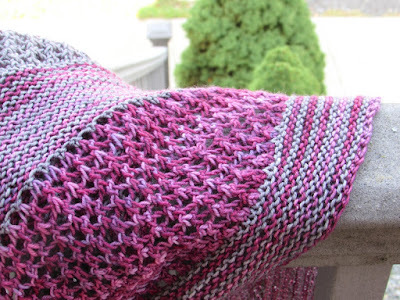 "That pattern is written for a different yarn weight. Do you think we can we rework the numbers?" 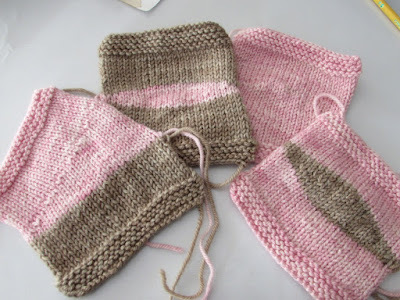 When we hung up, she had already made up her mind and purchased a new pattern. I'm still debating between 2 or 3 choices, but at least I've narrowed down the list. 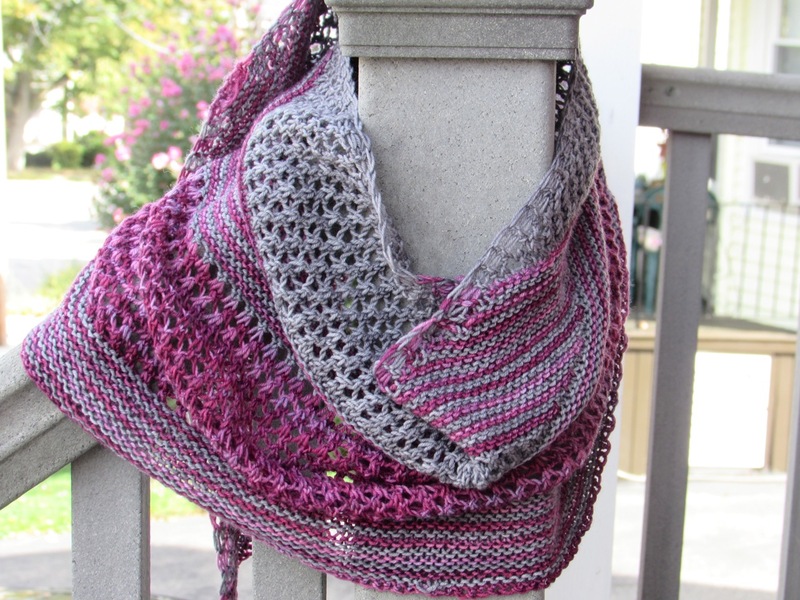 If you're feeling distressed about the refugee situation, Maria Magnusson is donating all of her September pattern sales to help the cause. Spread the word. 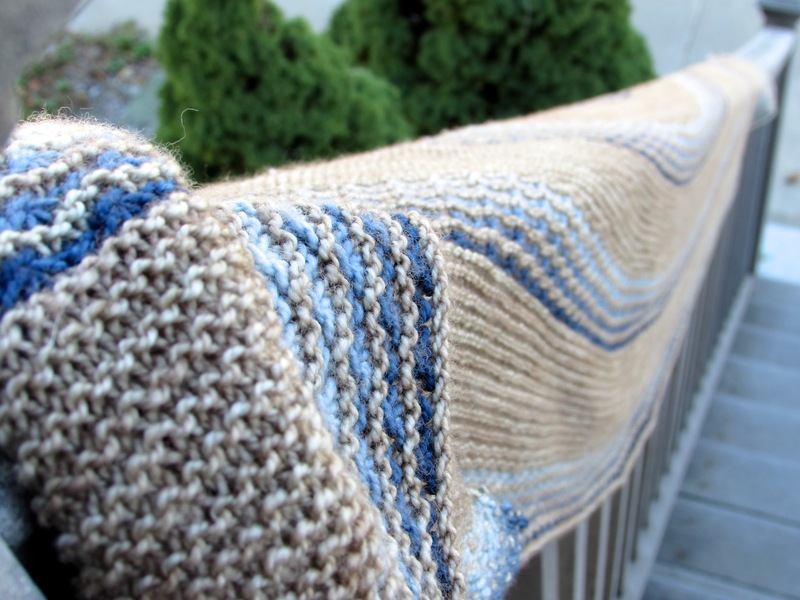 Since I'm on the subject of money, Knitty has launched a campaign for increased support. The online magazine will continue to be free, but they've tweaked the model a bit. Follow the link for details. 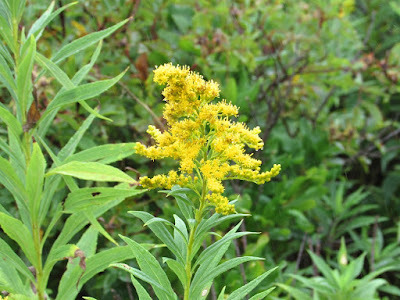 And for this week's color inspiration . . .
At the end of last week I came to the realization that to finish my Just Enough Ruffles Light scarf I had to work several rows with 768 stitches. I didn't do the math to figure out the total stitch count on those rows. 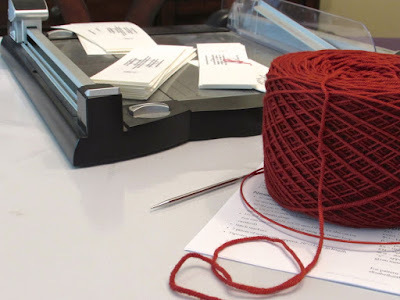 It was going to be a lot of stitches that required a lot of time. Over the weekend I went above and beyond my maternal duties and agreed to go to the Registry of Motor Vehicles to renew my daughter's car registration. She asked me in a moment of weakness when I was juggling a couple different things and wasn't really paying attention. You know those moments. You say "yes, yes" absentmindedly and don't realize the full impact of your agreement until it's too late. When Monday dawned, my daughter gave me some paperwork and left on her merry way (please, don't tell me she went to the beach), and I was left to deal with the Registry. Little did I know I had signed up for the extended stay at the RMV. I had to stand in line not once but twice and make several phone calls in the process. In the the interest of research, I verified that those little estimated wait time tickets are a lie. In the end I emerged with a registration renewal and a finished project. Just Enough Ruffles Light. 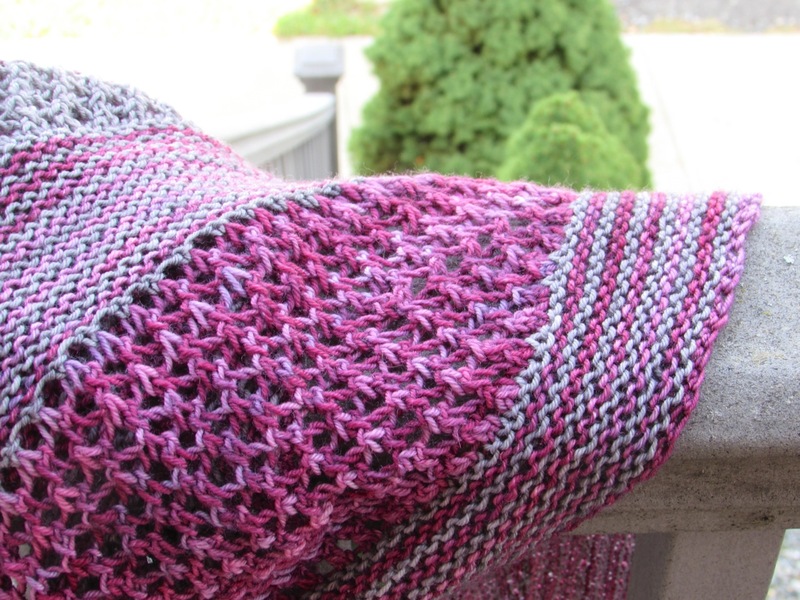 This scarf is long enough to wrap around a couple times and has wonderful drape. It's a handy little accessory. 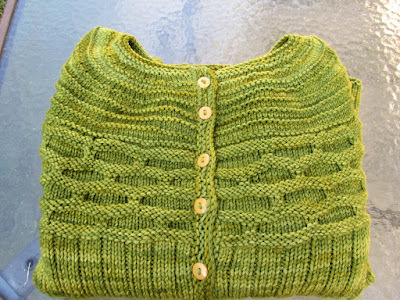 The yarn is Lillian, colorway Gourd . 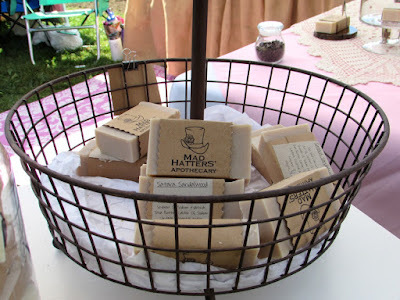 . . perfect for just a splash of fall. There's nothing like being confined to the RMV to boost knitting productivity. I felt sorry for all the non-knitters who didn't have anything to occupy their time.